The recent landmark California court decision in Vergara v. California – which ruled the state’s teacher tenure laws are unconstitutional – is exposing a growing rift between the Obama administration and the teachers unions that twice helped to elect him. 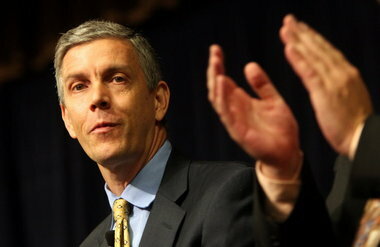 President Obama, through Education Secretary Arne Duncan, has continuously pushed for increasing teacher accountability and other education reforms unpopular with the teachers unions, but Duncan’s recent comments applauding the results of the California case is sending the unions and their allies over the edge, Businessweek reports. Duncan said the Vergara case “presents an opportunity for a progressive state with a tradition of innovation to build a new framework for the teaching profession that protects students’ rights to equal educational opportunities while providing teachers the support, respect, and rewarding careers they deserve,” according to the news site. But American Federation of Teachers President Rhonda Weingarten took Duncan to the tool shed over his take on the case in an open letter that “was clearly meant to gird her members for battle,” Businessweek reports. “Teachers across the country are wondering why the secretary of education thinks that stripping them of their due process is the way to help all children,” Weingarten said. “It is unexpected to see a top Obama administration official staking out a position so at odds with teachers unions. They are, after all, a key part of the Democratic Party’s base. But Duncan’s praise for Los Angeles Superior Court Judge Rolf Treu’s June 10 decision speaks volumes about the ruling’s potential to change the public education system in the U.S.
Union officials typically refrain from speaking publicly about the obvious political connection between the teachers unions and their beneficiaries, but unflinching union apologist Dianne Ravich didn’t hesitate to admonish Duncan for betraying his supporters in the Democratic Party.